The Other Art Fair are partnering with Habitat on a creative venture involving the work of emerging artists. Habitat are hosting an online competition to select the summer collection of figurative art works for their galleries section in-store and they have selected one of my works for entry. Out of past and present exhibitors at The Other Art Fair, they have selected me as 1 of 10 artists to be hosted on the Habitat website where Habitat customers will the vote for their favorite 5. These 5 pieces of art will then be printed and framed by the Habitat team and 20 prints will be sold in the three flagship London stores. Artists will also have a biography and link next to their art in store. Which is all very exciting! If you have a moment and would like to vote for me, please select No 4. On the diagonal. Iona Stern, Jo Vollers, Caroline Atkins and Helen Adie. 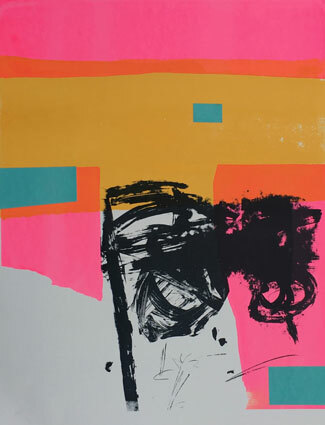 TAKE 4 painters and printmakers – an exhibition of colour, theatre, intrigue and expression. 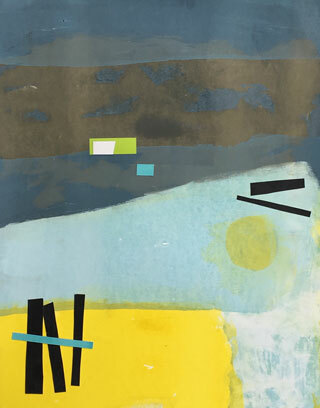 Monotype inspired by the view north from Saltburn beach. 33′ x 25′ framed in white wood.